- Little League World Series attracts approximately 90,000 young athletes from 7,000 clubs in 90 countries. - Series Finals Broadcast into 80 countries. - "WBSC's vision is to work with the IOC members and with all the Olympic sport federations to help empower youth and provide more opportunities for young people to be included in sport and the Olympic Games," WBSC co-presidents. - In 2012, 2,095,873 boys and girls played baseball and softball organized by Little League worldwide. WILLIAMSPORT, PA (USA) - Despite declining youth participation rates in sport, the capacity of baseball and softball to connect with a growing number of young people globally has been confirmed at this year's Little League World Series tournament, the finals of which are now underway in South Williamsport. The world series for local clubs, regarded as one of youth sports' most prestigious tournaments, began in early July and is down to the final 16 teams from over an estimated 7,000 clubs from over 90 countries, comprising approximately 90,000 11-13 year-old boys and girls, making it the largest participated international event in the sporting world. 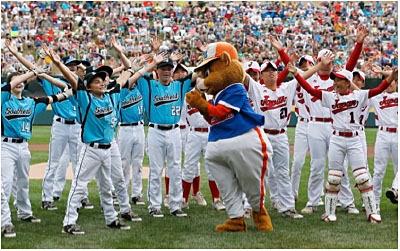 It is expected that 350,000 to 400,000 fans will fill the stadiums for the Little League World Series finals. The countries involved in the 2013 Little League World Series qualifiers participated in local and then international regional club competitions to be eligible for the finals that started last Friday. The international regional competitions involved junior club players from all backgrounds, cultures, faith groups and religions, and included players from the Australia region; Japan region; and the Asia-Pacific Region, including young players from Chinese Taipei, Guam, Hong Kong, India, Indonesia, Jordan, Kuwait, New Zealand, People's Republic of China, Saudi Arabia, Doha, South Korea, Thailand, Vietnam, United Arab Emirates, Singapore, Philippines, and Northern Mariana Islands. Boys and girls participated in clubs in countries from other international zones including the Caribbean Region: Antigua, Aruba, Bonaire, British Virgin Islands, Cayman Islands, Dominican Republic, Puerto Rico, Jamaica, Saint Maarten, and US Virgin Islands. Junior club players also participated from the Europe and Africa regions, which included players in Austria, Belarus, Belgium, Bulgaria, Cameroon, Croatia, Czech Republic, Denmark, England, France, Germany, Georgia, Ghana, Greece, Hungary, Israel, Italy, Kenya, Kyrgyzstan, Lithuania, Malta, Moldova, Netherlands, Norway, Nigeria, Poland, Republic of Serbia, Romania, Russia, Scotland, South Africa, Sweden, Switzerland, Uganda, Ukraine, and Turkey. Regional qualifiers were also held in the Mexico region, as well as the Latin America Region (Argentina, Bolivia, Brazil, Chile, Colombia, Costa Rica, Ecuador, El Salvador, Guatemala, Honduras, Nicaragua, Panama, Paraguay, Peru, Uruguay, Venezuela), and the Canada Region. Regional competitions were also held in the United States with the top 16 teams from the US and international qualifiers contesting the finals with the champion being crowned Sunday. While providing programs and opportunities for youth, especially young women, to play sport is a key focus for the Olympic Movement, events like the Little League World Series, which involves girls as well and boys, demonstrate the appeal and popularity of baseball and softball amongst young people around the world, and help showcase how the bat-and-ball sport could serve and strengthen the Olympic Movement. "Our sport appeals to youth and parents because it's non-violent; there's always a role on the team for every sized athlete and skill-level. Baseball and Softball are easy to learn and can be played almost anywhere, in almost any culture by boys and girls" said co-presidents Riccardo Fraccari and Don Porter of the WBSC (World Baseball Softball Confederation), which is leading the campaign to include baseball and softball in the 2020 Olympic Games. The Little League World Series also follows the recent U12 Baseball World Cup, which involved 14 national teams, and which is regarded as the biggest and most successful international youth world championship in sport. "Our goal is to work with the IOC members and with all the Olympic sports federations to help empower youth and provide more opportunities for young people to be included in sport and the Olympic Games," the co-Presidents said. "We are hoping the IOC members will find a place for baseball and softball at the Olympic Games in 2020, and send a message to more young people, especially young women, that the Olympic Games are for them." The Little League World Series is being broadcast by the multinational television company ESPN and their family of networks into 80 countries, with WBSC Olympic bid officials are hoping this will help to inspire more people to take up sport, while also highlighting the growing broadcast, sponsor and viewer appeal of baseball and softball across all levels. "The Olympic Games is the greatest goal for all sports, and, if included, we will place our passion for the Games and our sporting facilities, along with commercial, marketing and digital resources at the service of the Olympic Movement for the benefit of the athletes and young people, and to help Olympic Games organising committees and sport development," the WBSC leaders said. In 2012, 2,095,873 boys and girls played baseball and softball organized by Little League worldwide.